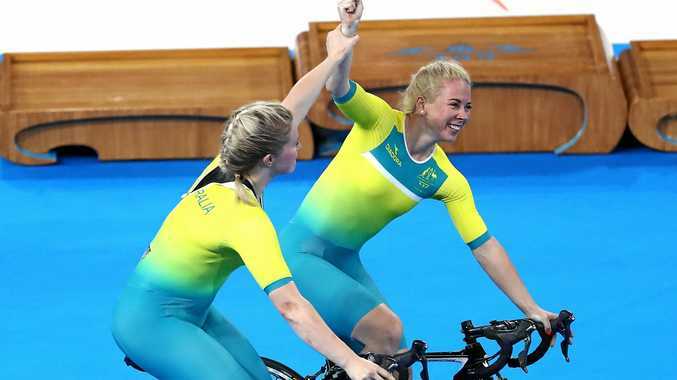 A MOTIVATIONAL talk from Anna Meares helped Kaarle McCulloch believe she could win the 500m time trial in an Australian 1-2 in Brisbane last night. Meares spoke to McCulloch after racing on Friday then visited the Australian pits before the final on Saturday where McCulloch produced a PB by 0.3 of a second to win gold in 33.5secs from compatriot Stephanie Morton. Having overcome a career-threatening injury, motivation issues, non-selection and a battle with depression that saw her consider leaving the sport four years ago, McCulloch was a popular winner in a packed velodrome. "My gosh I'm going to cry. It was amazing," McColloch said post race. "I had my family in the crowd. "Actually Anna Meares pulled me aside yesterday she said only a Meares girl has won this title. I want a McCulloch to win. "I feel like I've done it justice. I got into this sport because of her. To take that title tonight on her track is dream come true." Morton also smashed her PB by nearly half-a-second with 33.6 but it wasn't enough to deny McCulloch, 30, her second gold medal of the week. They both won team sprint gold together on the opening night and Morton beat her on in the semi-finals of the individual sprint on Friday. McCulloch rode at the 2012 London Olympics but missed out on the 2014 Glasgow Games and 2016 Rio Olympics as she considered her future in the sport. But last night she celebrated her return to the big time with family in the stands before doing a lap of the track with the Australian flag around her shoulders. "Obviously missing out in Glasgow due to injury hurt," she said. "Having to sit on the sidelines in Rio really that tore out my heart strings. "Sitting in the crowd in Rio and I thought to myself I've got this burning desire in my stomach. I'm not going to retire yet. I'm only 30-years-old. "That's not that old. I've dug in since Rio." It was the first time a rider other than a Meares had won the 500m TT since it was introduced to the Games program. Kerrie won in 2002 before Anna made it her own in 2006, 2010 and 2014, and last night she was in the velodrome to watch it unfold. Even Morton was thrilled for her teammate and pointed joyously to McCulloch after the final rider had crossed the line and her victory had been sealed.